Our facility painting service can transform the look of any building. When you own a commercial building, it is important to keep the building in good condition. No one wants to visit a rundown looking building or a building that has peeling paint and looks worse for the wear. 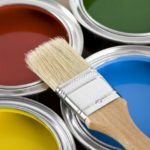 If you feel like your commercial building could use a little something to update it and make it look new and fresh, a facility painting service can help you achieve this goal. In fact, our painters can come and take care of everything for you! A fresh coat of paint on the outside of your building can completely transform the building. The great thing about paint is that it is incredibly versatile, and you are not stuck to the same colors the building was originally painted in. You can keep the same colors if you like, but you can also select new colors that will make the building look different and up to date. You can select bold colors like a blue or a red, or you can go with neutral tones like white, tan, or gray. Another popular choice is to paint mainly with neutrals but add a pop of a bright color on doors or trim. Any way you choose to take advantage of our facility painting service, it is sure to look fantastic. If you are looking for an experienced facility painting service for your commercial building in the Raleigh, North Carolina area, look no further than Prep-Rite Painting. Our professional painters can have your building painted and looking like new in no time. We are fast, friendly, and reliable. We also pay attention to detail and take pride in our work. Call us today to start transforming your building with a new coat of exterior paint. At Prep-Rite Painting, our facility painting service proudly serve Apex, Cary, Holly Springs, Fuquay Varina, Chapel Hill, and Raleigh North Carolina.